So, I guess this is a real life easter egg, as to be able to see this, you would have to be looking at Satellite pictures. 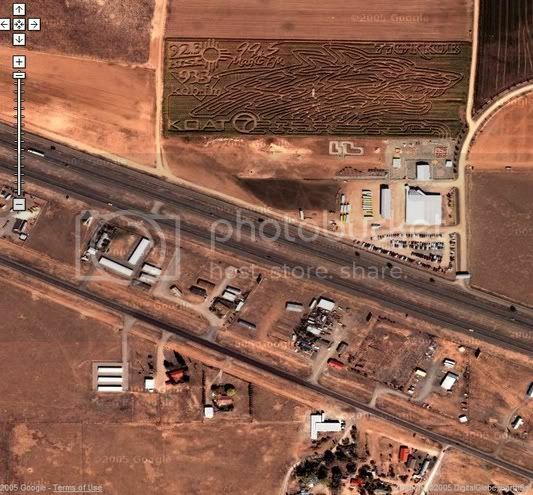 So, I guess you have to be a real nerd to be looking at Satellite pictures of the New Mexico freeway system, but hell it has paid off for me. I found this using Google Maps (maps.google.com), Satellite Mapping option. This is a field on Interstate 40, east of Albuquerque, New Mexico. This is between Edgewood and Moriarty, but it's very close to the most western exit for Moriarty. This image has not been fixed / doctored or anything like that. This is just as it looked on their server. If there is no picture above, click the link below. I must also say that who ever designed and created this is very good. It's almost as if the Advertising Aliens came down, and laid down an over priced crop circle. Here is a enlarged picture of just the field. Kev, it's a maze. Like the corn maze they have down by Rio Grande and Montano every fall. I agree, this one is pretty cool. Sometime maybe we ought to go out and see if we can figure out where this one is and what it's all about. And here I was going to SWEAR that it was all photoshop. How'd the Aliens get Photoshop? That explanes it all! Must also mean that I'm an Alien, cus I get photoshop for the most part. Nope. It's all real. No Photoshop used. LOL. You know, I was looking at the satellite photos of our area, and I noticed that, based on the lack of houses in the subdivision behind Las Tiendas and the one across the River where I went to the Christmas party with Grandma, the photos appear to be at least a couple of years old. It's possible that this field isn't even there any more, and that this maze was done for fall several years ago. I seem to remember hearing about a maze out there at one time. I know that this is older, as most Satellite Pictures are about 1 year to 18 months old, and can be older in outlying areas, like this. It is cool looking, an would have taken a lot of time, I'd think. I wonder why they did it, or if they advertise it.